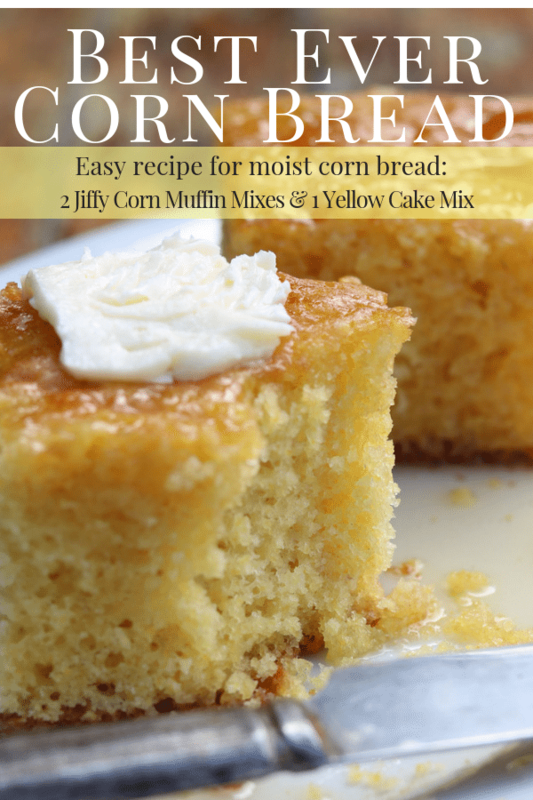 What do you get when you cross a yellow cake mix and 2 Jiffy corn muffin mixes….. 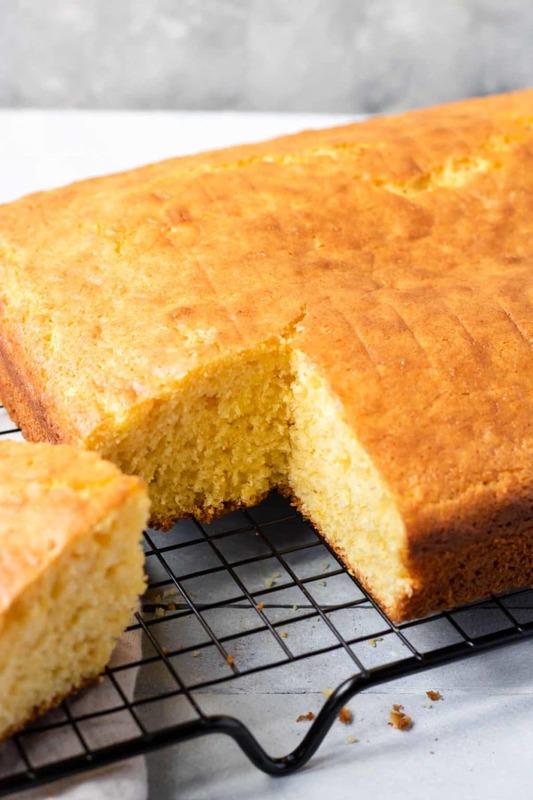 The Easiest and Best Ever Corn Bread recipe!!!! It’s so easy and so perfect. 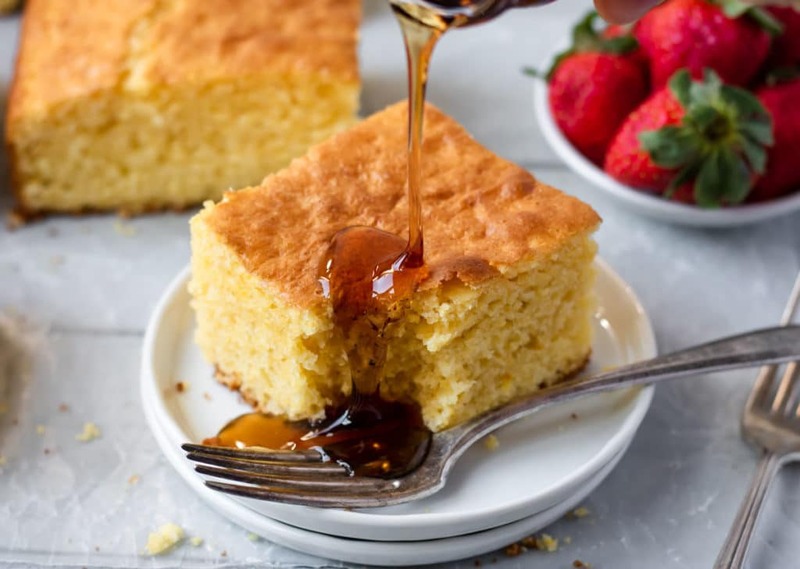 It’s everything you love in a good cornbread- it has a fluffy texture, it is just sweet enough- but not too sweet, it has that delicious hint of corn flavor, and it’s NOT dry and crumbly. 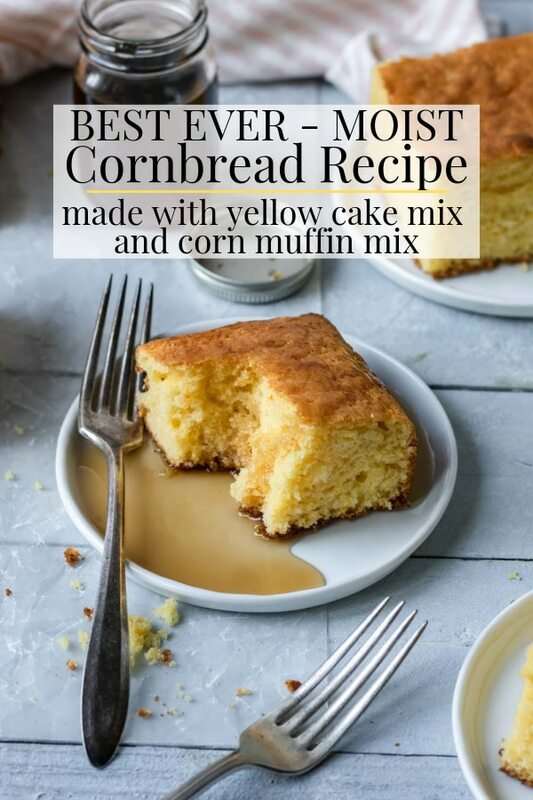 It is the moist cornbread that you have been searching for! 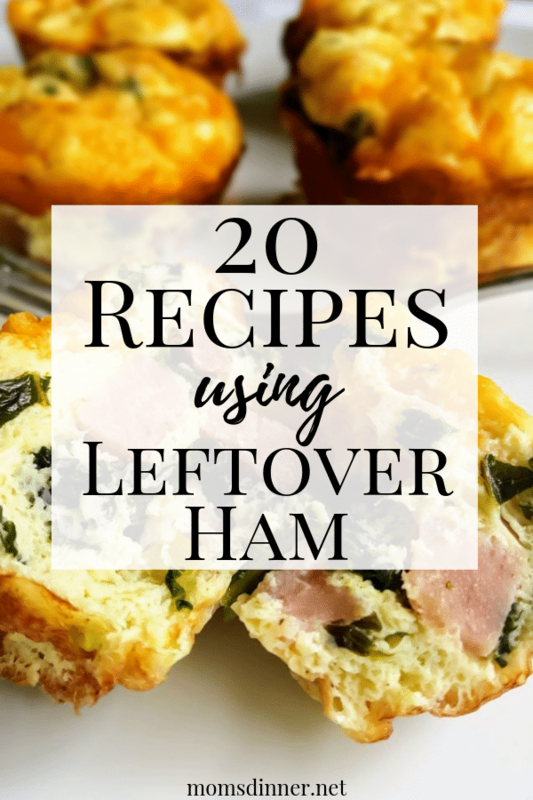 This recipe doesn’t need a lot of explanation, it’s just easy and good! 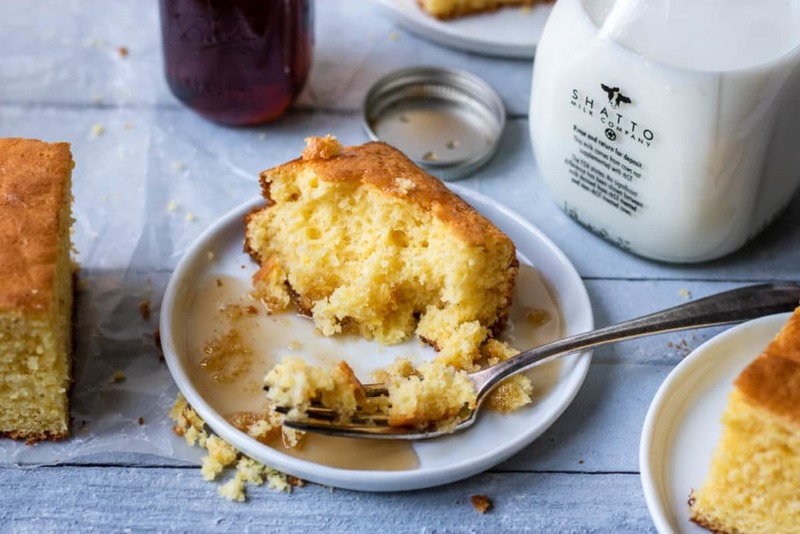 It will become your go-to corn bread recipe. Preheat your oven to 350 degrees. The next couple steps could not be easier. Stir everything by hand just until it is combined. Prepare a 9×13 baking pan with baking spray or oil. Pour the mix in and bake in the preheated oven for 30-35 minutes. Easy Peasy! Top with honey and fresh sliced strawberries for a sweet breakfast. Serve as a pancake substitute for breakfast and top with maple syrup. Perfect side dish for Skillet Dirty Rice & Beans. Serve it with Classic Chili or Quinoa & Sweet Potato Chili and crumble it into the chili instead of crackers. Perfect snack with a pat of butter and a little honey! 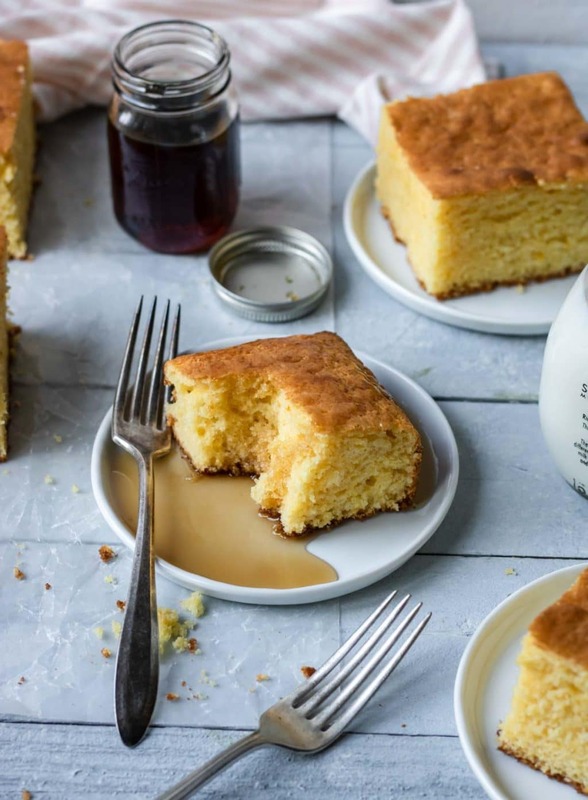 I hope you give this recipe for Best Ever Cornbread a try in your kitchen. 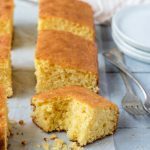 An unbelievably tasty and moist cornbread that is made with 2 corn bread mixes and 1 yellow cake mix for a perfect balance of sweet and savory. 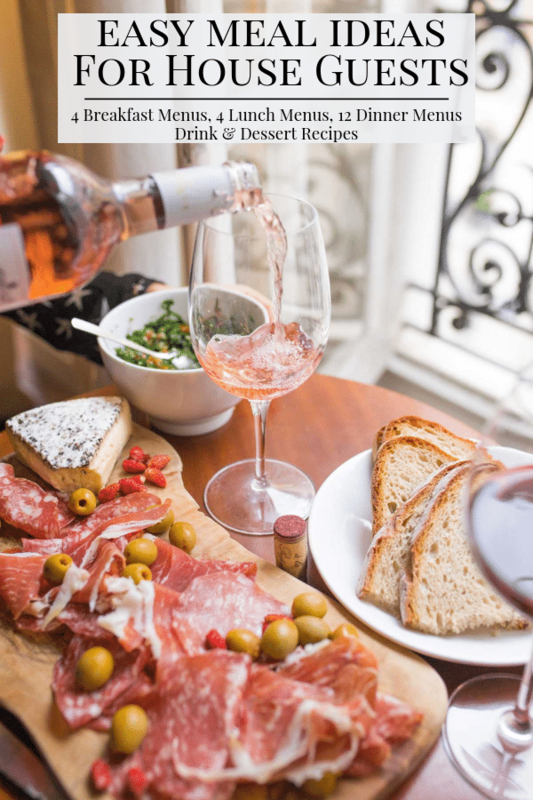 Mix all ingredients by hand, just until combined. Pour mixture into the prepared 9x13 pan. Bake for 30-35 minutes until the top is golden and a toothpick inserted into the center comes out clean. You can use any brand yellow cake mix that calls for 3 eggs, 1 cup water, and 1/2 cup oil. I hope you enjoy every bite of this cornbread!!! Do I need to lower the temp of the oven if use a non-stick/dark pan? 5 stars, so moist. So easy. Plenty to go around. Thank you! 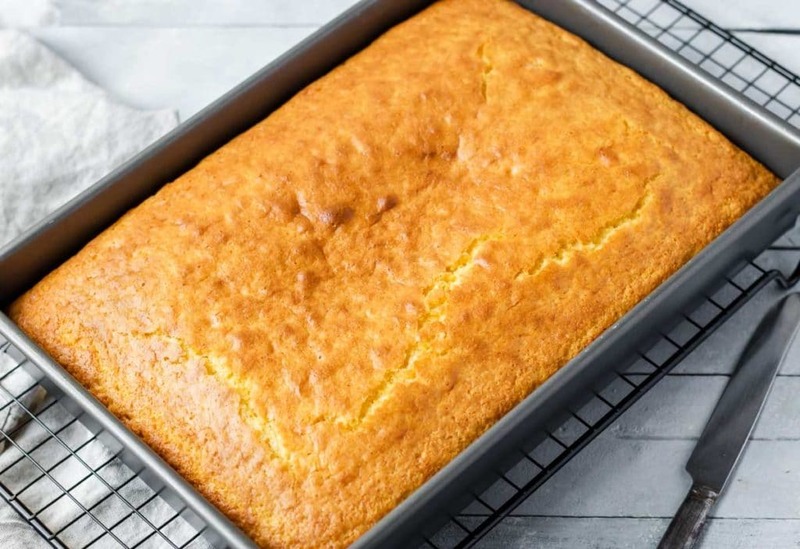 This is the best corn bread. This will be my new go to with chilli for our super bowl party. Your corn bread reminds me a little of the sally Lynn bread we used to get at one of the taverns in colonial Williamsburg. The wonderful thing was it was easy to make. Any special ideas for freezing it. All the hearts!!!! Thank you for your feedback! I have not tried to freeze these (we eat it too fast), but I think you definitely can. 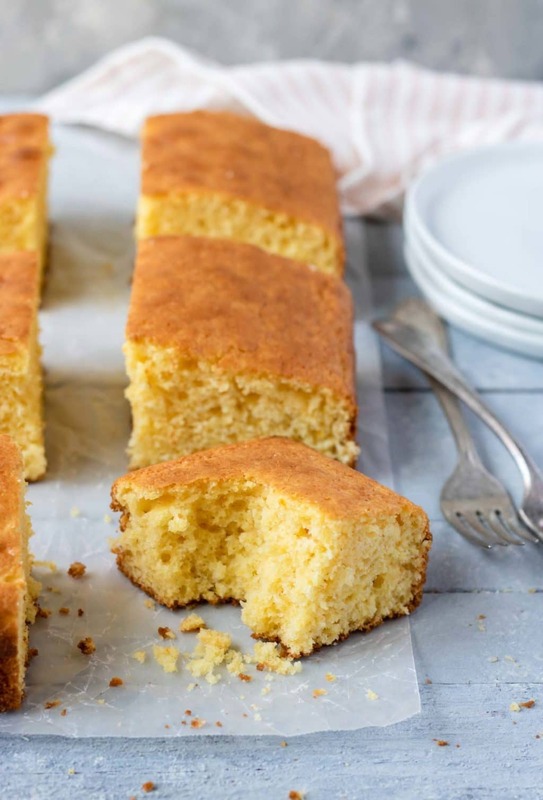 Just slice the cornbread into squares and freeze that way. Then thaw on the counter for a few hours, and finish for 30 seconds in the microwave. Has anyone baked this in cupcake pans? What would be the cooking temp/time? I have! I don’t recall the exact times, it’s been a while, but it should be around 15 minutes @ 350 degrees. If they are not done after 15 minutes, pop them back in for a minute or two until a toothpick inserted in the center comes out clean and the tops are golden. 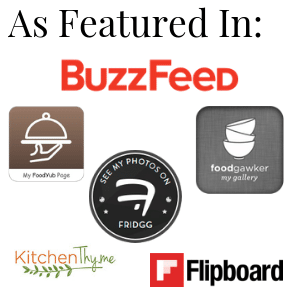 Thanks for checking out this recipe!! Stay warm out there! It is FREEZING here is KS. 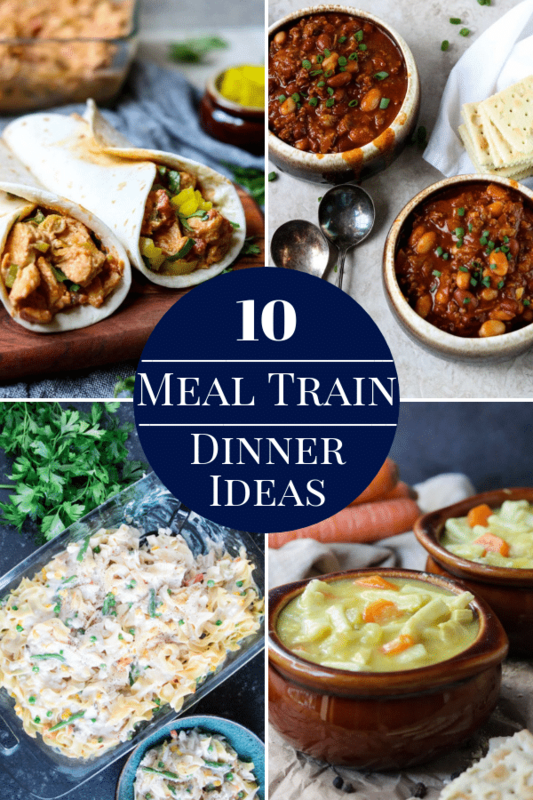 OMG this is going on our Sunday night dinner menu! This looks so good! Omg, drooling!! This corn bread looks incredible!! I am ready for some fall weather, chili and THIS cornbread!